Sesame Street Mr. Funny Man Episode: "3023"
The Office The Fingerlakes Guy シーズン7 第24話 "Search Committee"
30 Rock デイヴ・ウィリアムス シーズン6 第9話 "Leap Day"
^ “1962: Funny man Jim Carrey born in Newmarket, Ont.”. CBC. 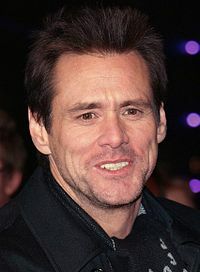 http://www.cbc.ca/archives/categories/arts-entertainment/humour/general-7/introducing-funny-man-jim-carrey.html 2012年6月20日閲覧. "On this day in history, Jan. 17, 1962, James Eugene Carrey was born in Newmarket, Ont." ^ Jim Carrey: The Joker Is Wild (2000). Knelman, Martin. U.S.: Firefly Books Ltd. p. 8. ISBN 1-55209-535-5 (U.S.).. Retrieved on 2006-03-24.